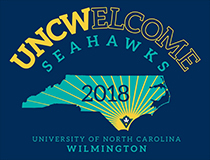 While classes at UNCW don’t start until Aug. 22, UNCW is ready to celebrate all there is to love about life at “the Dub” with its annual UNCWelcome program. The flurry of activities kicks off with the beloved tradition of “Move-In” on Saturday, Aug. 18, when approximately 2,070 Seahawks will move in to residence halls assisted by 1,850 campus and community volunteers. Students convene at the clock tower for the unveiling of the Class of 2022 flag and class photo and then “Trek to Trask” Coliseum for the ceremony that serves as the official academic welcome. Alison Taylor, a professor in the department of biology and marine biology, will deliver the keynote address. Immediately following the ceremony, there will be a picnic for students, faculty and staff on Hoggard Lawn. *Convocation is mandatory for first-year students and optional for transfer students. What better way to celebrate the first day of classes than with music and fireworks? The concert (artist to be announced) starts at 8 p.m. with fireworks slated to begin at 9. In the event of rain, the fireworks will be cancelled and the concert moved to the Warwick Center Ballroom. A showcase of involvement opportunities available on campus and in the Wilmington community. The rain date is Sept. 5. Note: Increased traffic and high demand for parking on campus is expected now through the end of August. Parking areas closest to event venues may be at capacity, requiring patrons to park in more remote lots and walk greater distances. Please plan accordingly.